Castle Stalker, set on a tiny island on an inlet off Loch Linnhe, half way between Glen Coe and Oban in the Scottish highlands. And yes, I did get my feet wet taking this image. A gorgeous softly lit morning, with just a hint of sun peaking through the clouds to kiss the castle. This little castle, really a tower house, dates back to he early 1300's, originally build as a small fort by the MacDougall clan, and improved by the Stewarts in the early 1400's. Today, the castle is entirely original and is one of the best preserved examples of medieval architecture in western Scotland. It is in private hands, but open to the public on a few select days of the year. A different view of Castle Stalker, set on a tiny island on an inlet off Loch Linnhe, half way between Glen Coe and Oban in the Scottish highlands. This view is only accessible at low tide. Christchurch Castle. The town of Christchurch, on the south coast of England, got its name from a monastery founded by Edward the Confessor in 1043. After the Norman conquest of England in 1066, Richard de Redvers, one of the Norman Barons who formed part of the invasion force of William the Conqueror, began building the castle at Christchurch in the early 1100's. The castle was completed by the de Redvers family around 1150 and remained the center of power in the area for half a millennium. The castle's fate was sealed during the English Civil War of 1642-1651, when it was used to successfully defend the Royalist town against the invading Roundheads of Oliver Cromwell in 1645. But the Roundheads eventually won the Civil War and so Parliament ordered the destruction of the castle in 1651 to prevent it being used in any future wars. Local people used the building material for their own purposes and all that is left today is the ruin in this photograph. 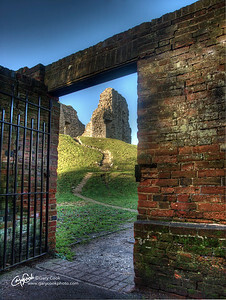 The image was taken through an old gate leading from the Priory to the castle. 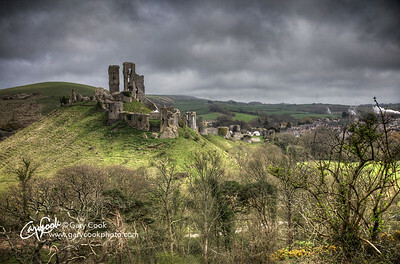 Corfe Castle, standing above the tiny village of Corfe in the county of Dorset, in the south of England. The original castle was built by William the Conqueror, shortly after after the Norman invasion of England in 1066. The castle survived for many centuries, once having been owned by Queen Elizabeth 1st. But the castle finally met its end and was demolished in 1645 on the orders of Parliament, after falling to a siege by the Roundheads during the English Civil war. 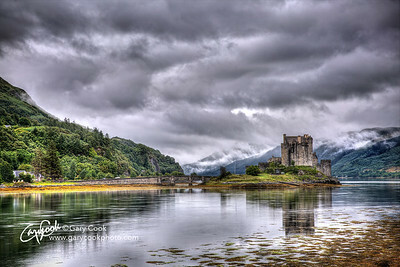 Eileen Donan Castle. This is the view of the castle from the little village of Dornie, by Kyle of Lochalsh, in the utterly beautiful Scottish highlands. 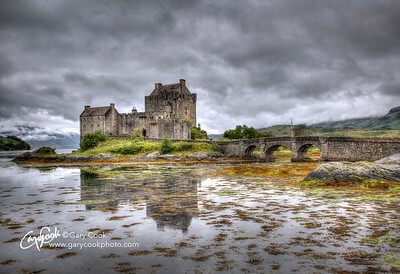 Eileen Donan is the quintessential image of historic Scotland. The castle has its roots deep in the 13th century and it exudes history whenever I step onto its ramparts. Eileen Donan Castle. This is especially for Rebecca Eien and Judith Eien. 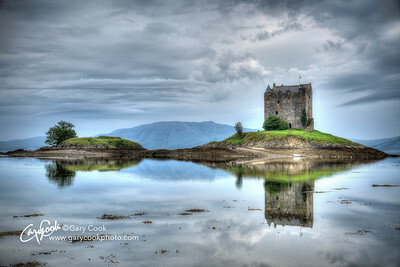 Located close to the village of Dornie, by Kyle of Lochalsh, the castle occupies a commanding spot overlooking the loch. 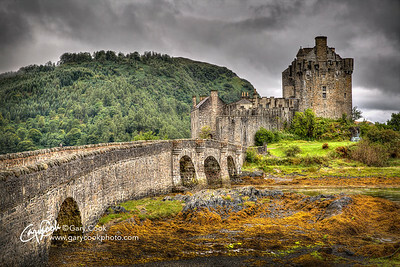 Scotland is filled with beautiful castles but Eileen Donan is perhaps the quintessential image of historic Scotland. The castle has its roots in the 13th century and is named after Donnán of Eigg, a Celtic martyr from around AD 617. If the castle looks familiar to you, it's likely you've seen it in many films and TV productions, such as the movies "Highlander" and "Elizabeth: The Golden Age", to name just two. Eileen Donan is reached by taking the road to the Isle of Skye in the Scottish highlands. The castle and the surrounding area are so arrestingly beautiful that I can't bring myself to pass another opportunity to see it yet once again whenever I'm in that part of the world. The site of the Cathedral in Paderborn, Germany, dates back to the time of Charlemagne. It is the last of several Cathedrals to be built on this site. History first records a founding church on this site from around AD 777, which was eventually built into the first Cathedral. Unfortunately, this was destroyed by fire in around 1000 AD. A second Cathedral was consecrated in 1015, but it too was destroyed by fire in 1058. The third attempt was also ravaged by fire in 1133, but the core of that building survived and the crypt from that time survives in the existing building. The current Cathedral was erected in the 13th century and, thankfully, seems to have been spared the fates of its predecessors. 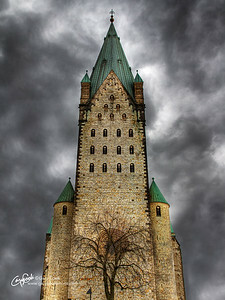 Today, it presents an imposing silhouette on the skyline of the small city of Paderborn. 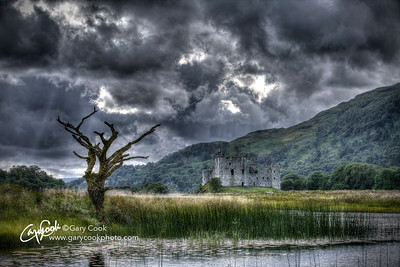 Kilchurn Castle. 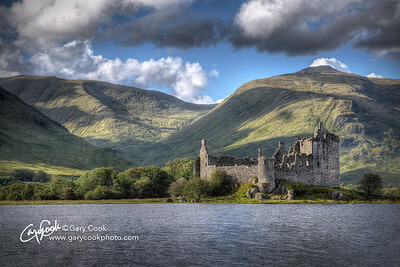 The castle, built on a rocky outcrop on the north eastern shore of Loch Awe, Scotland, began life in the fifteenth century. Kilchurn Castle was the first of several castles built by the powerful Campbell Clan, and helped them dominate the central Highlands for more than 200 years. The castle fell into disrepair after the Campbells relocated to Taymouth Castle in the early 1700's. Lightning badly damaged the castle in 1760 and the roof was completely caved in by 1770. The Campbells failed to sell the castle to the Scottish government and it has remained as a ruin to this day. 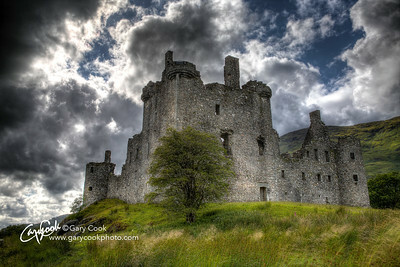 Kilchurn Castle is off the beaten path and is fairly isolated in the Scottish Highlands. Its location forms one point of a triangle with Oban and Glencoe on the other points. The holy Island of Lindisfarne, just off the coast of the far north east of England, can only be reached along a causeway that is infamous for sweeping cars away with the advancing tide. The island has an ancient history stretching back to the dawn of Christianity in the British Isles. But the Island also has a long history of warfare. Positioned close to the Scottish border, it has been the scene of countless battles and invasions, not just by the English and Scots, but also from Viking raids. In the 16th century King Henry VIII ordered the island to be fortified against possible invasion by the Scots, and the Castle seen here was the center of those fortifications. Sadly, the reformation ordered by King Henry VIII destroyed the monastery on the island, first by using the former monks’ home as a naval store, and later through plunder of the stone used for its construction. Lindisfarne Castle bedroom. The holy Island of Lindisfarne, just off the coast of the far north east of England, can only be reached along a causeway that is infamous for sweeping cars away with the advancing tide. The island has an ancient history stretching back to the dawn of Christianity in the British Isles. But the Island also has a long history of warfare. Positioned close to the Scottish border, it has been the scene of countless battles and invasions, not just by the English and Scots, but also from Viking raids. In the 16th century King Henry VIII ordered the island to be fortified against possible invasion by the Scots, and the Castle seen here was the center of those fortifications. Sadly, the reformation ordered by King Henry VIII destroyed the monastery on the island, first by using the former monks’ home as a naval store, and later through plunder of the stone used for its construction. But the Island castle survives and this is one of the smaller bedrooms overlooking the sea. 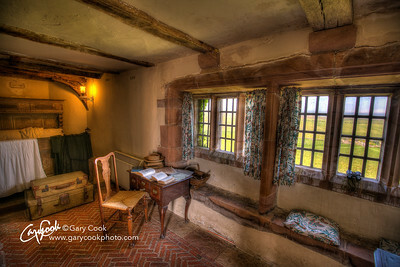 It’s beautifully tranquil and I wonder how many families have gazed out to sea from these windows over the centuries? Lindisfarne Castle bedroom. The holy Island of Lindisfarne, just off the north east coast of England, has an ancient history stretching back to the dawn of Christianity in the British Isles. The Island and castle have been the scenes of countless battles and invasions, not just by the English and Scots, but also from Viking raids. 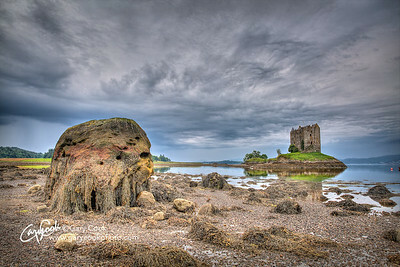 In the 16th century King Henry VIII ordered the island to be fortified against possible invasion by the Scots, and that castle remains until this day. 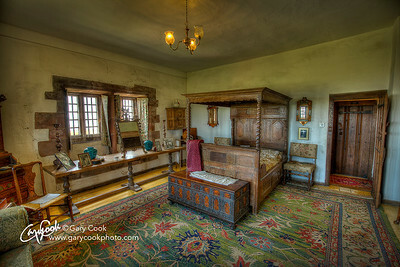 The image here is the largest of the castle’s bedrooms and has a commanding view of the sea. The holy Island of Lindisfarne, just off the coast of north east England, has an ancient history stretching back to the dawn of Christianity in the British Isles. But the Island also has a long history of warfare. Positioned close to the Scottish border, it has been the scene of countless battles and invasions, not just by the English and Scots, but also from Viking raids. In the 16th century King Henry VIII ordered the island to be fortified against possible invasion by the Scots, and the Castle at Lindisfarne was the center of those fortifications. Sadly, the reformation ordered by King Henry VIII destroyed the monastery on the island, first by using the former monks’ home as a naval store, and later through plunder of the stone used for its construction. But time passes and the surviving Castle became a private home, being purchased by the publishing magnate Edward Hudson in 1901. 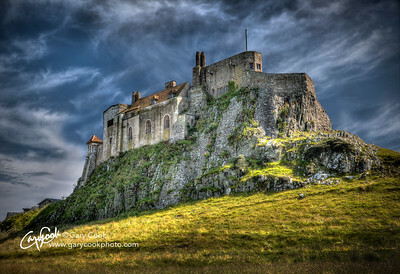 Since 1944 the castle has been in the hands of the British National Trust and is usually open for tourist visits daily. 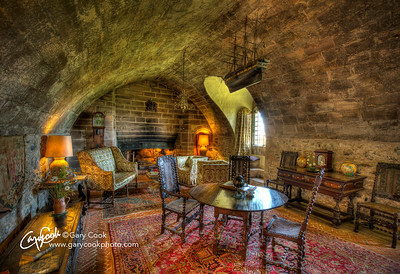 The image here is the twin of the image of the Dining room, with a similar “Hobbit” style roof! The room is laid out just as it was used in the early 1900’s. State of the Art Kitchen. This is the (tiny!) 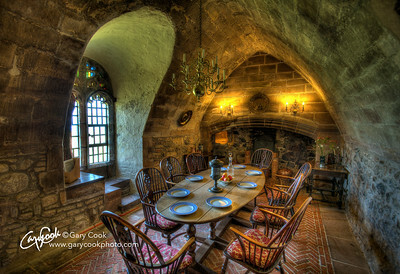 kitchen in Lindisfarne Castle, on Lindisfarne Island, northern England. 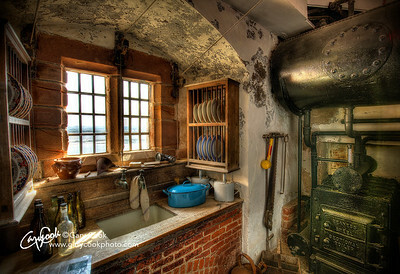 In the early part of the last century this was considered to be state of the art in kitchens and the height of luxury. At the time it was unimaginably advanced in a castle that dates back to the 16th century. How times have changed! The holy Island of Lindisfarne, just off the coast of northern England, has an ancient history, and has one of the oldest churches in the U.K. Lindisfarne has recorded history going back to 500 AD. 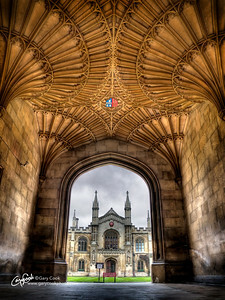 The College of Corpus Christi in the city of Cambridge, England, was established in 1352. This beautiful building, surrounding a central court, was founded by the townspeople of Cambridge, an unusual thing to happen when most colleges and monasteries were founded by the nobility of the time. But opinions change (as they do now!) and the College was sacked by the townspeople in 1381 during the Peasants’ Revolt, led by the town mayor! But the College survived this assault and prospered through the centuries. During the War of the Roses in 1460, the College was rich enough to to fund the purchase of cannons, arrows, and armor to defend it from plunder. Corpus Christi suffered some instability during the Reformation of King Henry VIII, but escaped the worst of the religious upheavals of the time. Henry’s daughter, Queen Elizabeth I, became a patron of the College during her reign in the 16th century. Today, Corpus Christi is one of the richest colleges in Cambridge, with one of the highest academic success records. The image here is of the entrance archway, directly from the public street outside into the central courtyard. I love the intricate details in the beautifully preserved ceiling stonework, and the way the natural light is reflected by the flagstones to illuminate the roof. Mathematical Bridge, Cambridge, England. 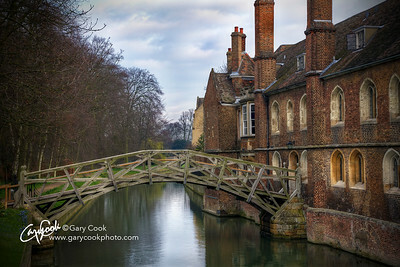 This is a wooden footbridge in the city of Cambridge, which connects two parts of Queens's College across the river Cam. The bridge was designed by William Etheridge, and actually built by James Essex in 1749. The bridge acquired its popular name from its appearance as an arch, even though it is actually built entirely from straight pieces of lumber. The river Cam is a popular student (and tourist) attraction for "punting". A punt is a flat bottomed boat that is propelled by using a long staff pressed into the river bottom to push the boat along. It looks easy, but it isn't! I tried it and although I didn't actually fall into the river, I came pretty close several times. Just around the corner from the ancient Salisbury Cathedral is this little pub. 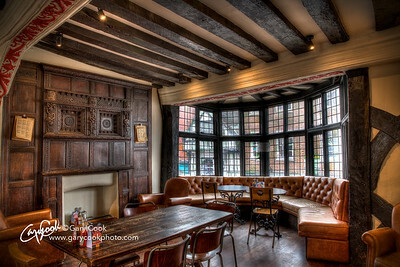 The main part of the pub, from where this photo was taken, is on the second floor of the building with an old passageway passing beneath where former horse drawn wagons would bring in new supplies of ale. This pub has been there for centuries, but today it’s still in business, serving excellent beer and food as it has always done. I love the astonishing detail in the old wood and how the signs of modern day mingle with the ancient surroundings. 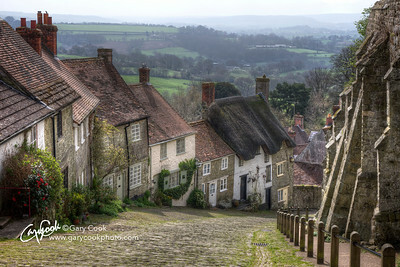 Gold Hill, Shaftesbury, Dorset, England. With crooked houses and a cobblestone street, Gold Hill is probably one of the most photographed streets in England. Its position on a steep hillside on the edge of the town evokes a forgotten England, which probably never existed, of early morning mists and thatched roofs; a time when everything was perfect and we had time to know one another. The stuff of dreams.... The street was made famous in England by the (now) much more famous Ridley Scott, who directed a timeless TV ad for Hovis Bread which featured a young boy pushing his bicycle up the steep hill to deliver bread to his customers. I couldn't resist photographing it. 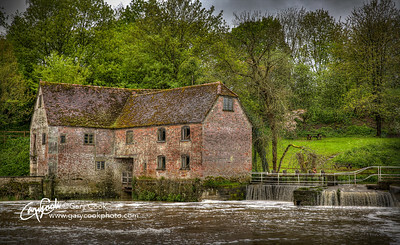 Sturminster Newton Mill. 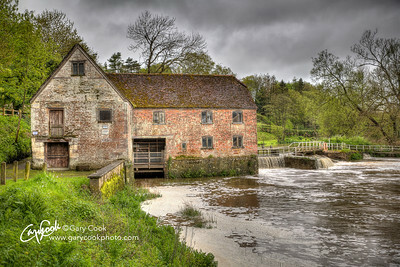 The Domesday Book of 1086 records there being a grain mill in the village of Sturminster Newton, on the banks of the River Stour, in the county of Dorset, England. Earlier records suggest a Saxon mill existed on this site in 1016, before the Norman Conquest of Britain in 1066. Mills, by their nature, don’t last forever. The combination of mechanical stress, rising damp from the river, and the ravages of time, all take their toll. 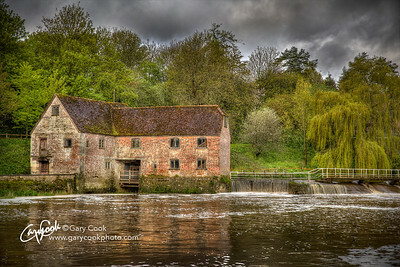 The present mill was therefore rebuilt in the mid 1600’s on the original Saxon stone foundations. For the next 300 years, until the start of the 20th century, the two mill water wheels provided around 12 horsepower, enough to drive four sets of stones. In 1904 the mill was upgraded, and the two water wheels were replaced with a single water turbine. The mill is still in use today, mainly providing “artisan” flour to local bakers, and is open to the public many times a year. I was able to sample some of the local bread made from this flour (delicious!) and it was a thrill to realize the flour had been made using mill stones centuries old.